The Acceleration of Contract Performance is an agreement between The Contractor and The Owner with regards to getting work done in a specific amount of time. To download this free form, just click on the link at the end of this page. 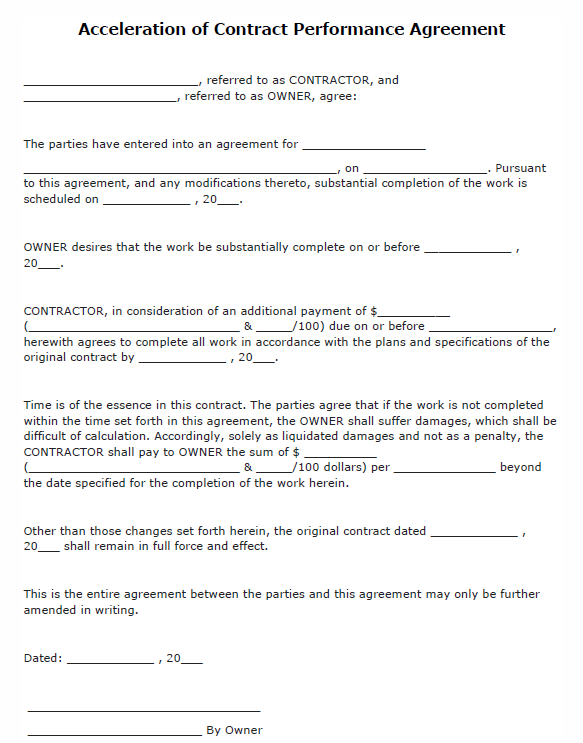 It is agreed that both the parties have entered into this agreement, for completion of specified work on the specified date, the owner also desires that the work should be substantially completed on or before a specified date. The contractor will complete the work before time and if he does he will be paid an additional payment of a specified amount. He also agrees to complete the work in accordance will all the plans and specifications of the original contract.